The newly formed Capitol Hill Pride non-profit is planning the Capitol Hill Pride Festival March & Rally in its ninth year at Seattle Central College. Capitol Hill Pride's Directors, its supporting organizations and community are proud to have started the Capitol Hill Pride Festival in 2009 and work to create awareness and support of the LGBTQAI community. Capitol Hill Pride is an all volunteer non-profit and welcomes volunteers and supporters of all backgrounds. The focus of Capitol Hill Pride 2018 will be continue to create awareness of civil rights, acceptance and celebration as we continue organizing one of the Northwest’s largest Pride gatherings in the heart of Seattle. The month will culminate with the Capitol Hill Pride March & Rally starting at 10am -3pm and 8-10pm on the campus of Seattle Central College which will feature speakers and non-profits, live music and the Capitol Hill Doggie Drag Costume Contest at Noon. Charlette LeFevre - is current Director of Capitol Hill Pride having established the Capitol Hill Pride Festival in 2009 as Vice President of the Capitol Hill Community Council. Currently contributes to the Seattle PI Neighborhood Blog since 2009 and is current director of the Northwest Museum of Legend and Lore since 2004 conducting historical tours of Capitol Hill. Combining science and events, Charlette shares a social justice interest in her activities and writings identifying with the Bi-community. Charlette has a BA in Research and Design from Wright State University. Accomplishments: Establishing Capitol Hill's largest street festival. Saving four large trees on Capitol Hill's Broadway and helping establish the Seattle city ordinance that bans the display of human remains without the deceased's consent. Philip Lipson - Librarian has a Master's degree in Library Science from Wayne State University in Detroit and has had experience in both public and academic libraries. Co-Director of the museum since 2004, Philip Lipson is part of the Bi-community. Philip Lipson along with his partner Charlette LeFevre have written a book on the Air Force's first military plane crash in Kelso and are referenced researchers in Pres. Obama's history in Seattle as a baby. Philip Lipson has worked for the IRS and has helped organized the budgets for many conferences. In 1980 Philip ran for Sheriff of Wayne County, Michigan, Libertarian Party. Lucky for the library he lost. His slogan was "Behave Yourself", a motto he still lives by today - or so he says. David Kennedy - is current Security Director of Capitol Hill Pride having volunteered since 2010. Asukaa Jaxx - is current board advisor and long time Capitol Hill Resident representing the Intersex community. Copyright © 2012-2018 Capitol Hill Pride. All rights reserved. 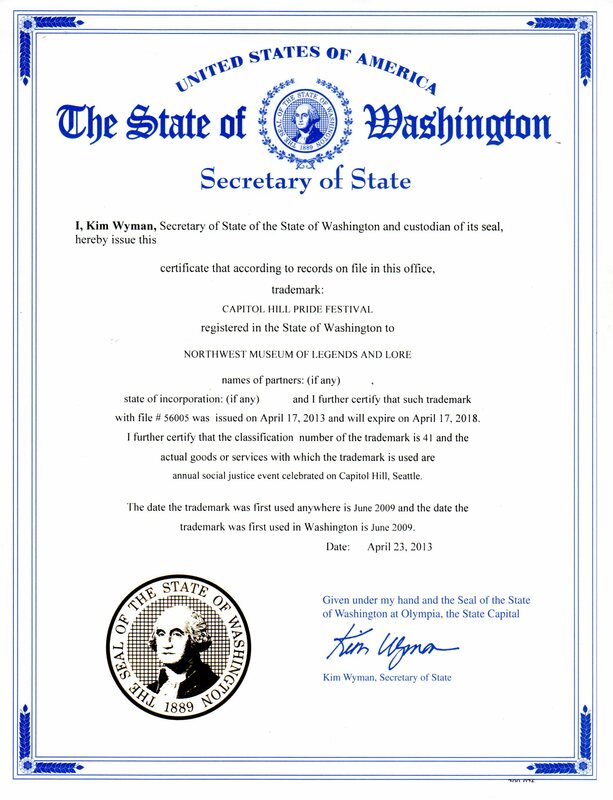 The name "Capitol Hill Pride", "Capitol Hill Pride Festival" is a registered trademark and tradename of Capitol Hill Pride within the State of Washington. 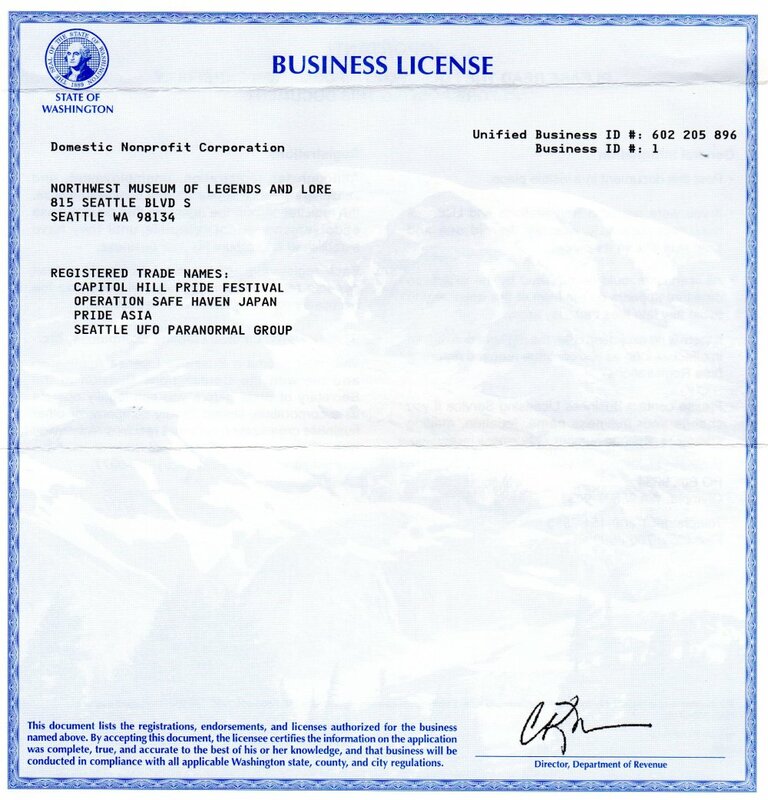 The name "Pride Asia" is a registered trademark and trade name of the Northwest Museum of Legends and Lore within the State of Washington.